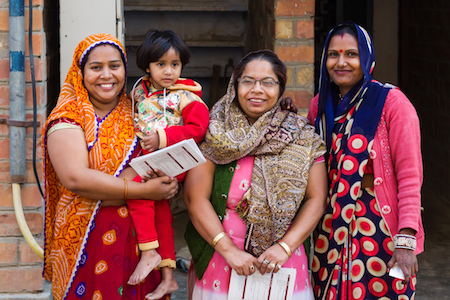 Nazdeek is training women paralegals in two of Delhi’s informal settlements to identify gaps in basic service delivery and report them via SMS text message. Many essential services that are required by law such as those concerning health, nutrition, sanitation and housing are currently denied to women living in informal settlements in Delhi. These SMS reports are being collected and mapped as part of the SMS for Justice program. The text messages will initiate actions by community paralegals and Nazdeek staff. These time sensitive actions can include fact-finding investigations, formal right to information requests, advocacy efforts, or filing formal complaints with the relevant government officials. The data will also be collected and analyzed to be used in periodic submissions to the government offices in charge of these services and to address systemic barriers in service infrastructure. Many of the women in these informal settlements belong to the Dalit and Muslim communities and face numerous challenges to obtaining basic services and have no existing mechanisms to demand improved services.